The lower chamber wants to set the threshold requiring voter approval of some property tax collection increases at 6 percent. The Senate put the trigger at 4 percent. A bill that would require voter approval of property tax increases in larger Texas cities and counties won initial approval from the House on Saturday, signaling that Gov. Greg Abbott may get his top priority accomplished in the special session. But the House and the Senate will have to iron out some major differences between the versions of Senate Bill 1 they each passed. Chief among those is agreeing on the amount of a property tax increase that will require voter approval. The House gave preliminary approval Saturday, voting 98-43 to require elections when larger cities and counties increase tax collections on existing buildings and land by 6 percent compared to the prior year. The Senate set that threshold at 4 percent. Despite the lingering differences, Saturday’s vote was a major step forward for legislation that died at the end of the regular session and partially prompted Abbott to call lawmakers back to Austin this summer. State Rep. Matt Shaheen, R-Plano, unsuccessfully tried to amend SB 1 so that the House’s election trigger would also be at 4 percent. But the House rejected that after state Rep. Dennis Bonnen, who carried the bill in the lower chamber, said he’d withdraw the legislation if the amendment passed. “If you do this and change this bill, you don’t give protection to taxpayers,” the Angleton Republican said. “Anyone who is suggesting that is giving you bad information,” he said. Bonnen said the only way he could get the bill out of the House Ways & Means and Calendars committees and on to the full House was to promise that he wouldn’t let the election trigger go lower than 6 percent and wouldn’t agree to any amendments. Bonnen kept his word Saturday and fought off more than a dozen amendments. When the House passed one amendment that would let cities and counties exclude some taxes for transportation spending from the election threshold, Bonnen insinuated that he would pull the bill and successfully got his colleagues to reconsider their vote. The amendment failed the second time around. 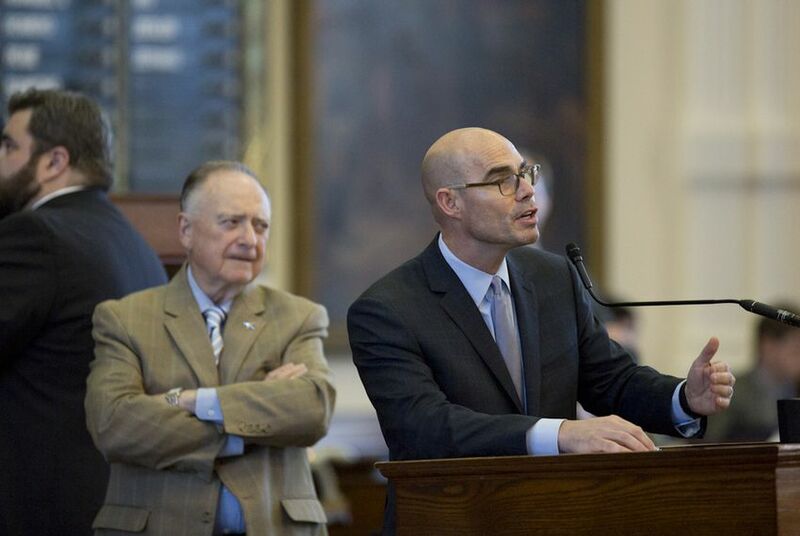 "I sure as hell don’t want to be here for another special session," Bonnen said. State Rep. Roland Gutierrez gave a fiery speech about rising commercial property values as he pushed an amendment that would cap how much the appraisals of such properties can rise each year. "If the consequences are to bring me back, then bring me back," the San Antonio Democrat said before the amendment failed. Other unsuccessful amendments included proposed changes to the size of cities affected by the bill and an attempt to exempt hospital districts. With only four days left in the special session, the House still has to approve the bill in one more vote before it and the Senate appoint conference committee members, who will reconcile differences and send the reworked legislation back to both chambers. Sen. Paul Bettencourt, R-Houston, authored the bill and has already said he’s ready to start negotiating.